As you probably already know, we have seven physical energy centers (chakras) that we learn how to use during our spiritual growth. Once we have learned how to use a certain center, we continue forwards to the lessons of the next center. Like that, we develop from center to center, while our consciousness is usually focused on the center that we are learning at the time. Sometimes we learn the lessons of several centers at the same time, but our main focus usually stays on only one of the centers. Like that, we keep on moving through the lower energy centers until we reach the heart center. The heart center is special, because through it we can open a portal to our non-physical energy centers. Our non-physical energy centers are mentioned in almost every culture in the world. According to the Jewish kabbala, “Israel” is a code name for all of us; each one of us is “Israel”. If you split the Hebrew word Israel (ישראל) into two, you will get to words: Yashar (ישר) and El (אל). Yashar means straight and El means God. So “Israel” can also mean Straight to God – Those who can communicate directly with their inner God. Since Israel is made from twelve ”tribes” and we know that we have seven physical centers, We can assume that we have another five energy centers hidden somewhere. 12-7=5. I have found a picture of these five hidden centers in the pages of the summit lighthouse. Since I can not publish that picture in here I have made my own version, but with (more or less) Buddhist symbolism. 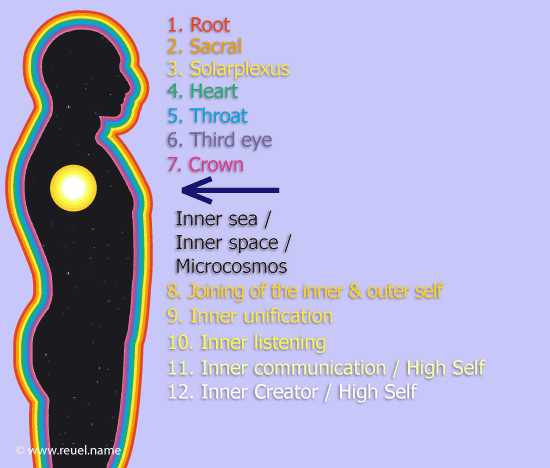 In the picture, the non-physical energy centers are places above us, because it symbolizes our development “upwards”, towards God in heaven. However, according to the channeling by Shirley Hallel Gutman, our pineal gland works as a two way mirror: Everything that we think is outside of us is actually inside us. The outer world is a reflection of our inner world. This perception is strengthened by the structure of the Jewish Menorah. 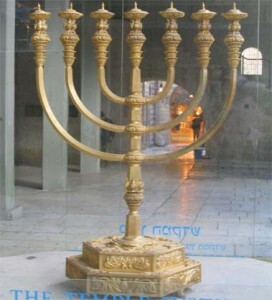 The Jewish Menorah is a candle holder that was placed inside the Temple of Solomon. The design of the Temple of Solomon itself is another clue as to who we are. According to this site, the Temple of Solomon was built in the shape of our physical bodies. In the pictures of the temple man, on that site, the Dvir (דביר) (the holy of holies), is placed in our heads. This can not be true as I will soon show you. So I made a new diagram of the temple man that shows the Dvir in it’s right place: the heart. 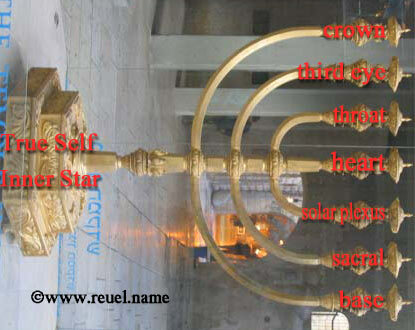 According to the bible, inside the Temple of Solomon (= our physical body), there were Menorahs. It’s a bit hard to see at first, but once we rotate the photo to the right, we can clearly see that the Menorah is in fact a scheme of our energy system. The Crown energy center balances the Root center. The third Eye center balances the Sacral center. 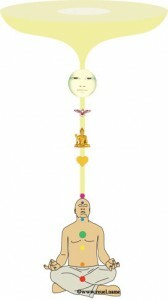 The Throat energy center balances the Solar Plexus center. Another thing to notice is that if we go inwards, through the Heart chakra, we will find our true selves. We can also notice that the connection to our true selves is not very substantial. Another important thing to realize is that we do not develop upwards – We develop inwards. We are like an onion that sheds it’s skins/layers until only the inner core, the true self, remains. Now that we know what our energy system looks like, we can examine all our different energy centers in more details. This center connects us to our physical being and physical world. Through the lessons of this center, we learn how to process the information coming to us through the senses of our physical bodies. We learn how to deal with the emotions and fears of our physical existence. We learn the value of our physical life. If this center is damaged or blocked, it can easily lead to death, because when our connection to our physical existence is weak, it’s very easy to exit the physical existence, and go back to where we came from: light. Through this center we communicate with other physical beings. We learn how to process emotional energy. This center is directly connected to our emotional body. If this center is damaged or has been blocked due to emotional trauma, we can become emotionally numb – we will not feel much of anything, or we won’t be able to connect with other people emotionally. This center connects us with our Mental bodies. In this center our egos are “born”. In this center we individualize our selves in relationship to other physical beings and separateness is created. We also learn “who we are” (or at least that’s what our egos think they learn) and what is our place in the universe. This is our most important center; through it we create our first connection with our higher energy centers. We also learn how to express true love between physical beings. We begin to learn how to do things unselfishly, because we begin to realize that everything is one – we are all part of one consciousness. We learn that when we help other physical beings – we also help ourselves. We learn that we are our world and that once we heal our inner world – our outer world is healed as well. And the other way around. We learn that our outer world is only a reflection of our inner world. This center is a communication center. We learn how to communicate better with physical and non-physical beings and we also learn how to listen to our inner guidance. When the throat chakra begins to open it feels like an inner itch that will not go away by coughing. Our inner and outer communication passes through this center. If you want to be able to listen to your inner guidance, all you need to do is permit it to happen. Without your conscious permission, this inner communication will probably not work. You can give yourself permission like this: “I permit myself to hear my inner guidance, whenever my higher Self thinks I need it”. This center is actually made from many different smaller centers, located in our heads. All the organs in our heads are connected to our Third Eye chakra: Both parts of our brains, which process the messages and images we receive. The pineal gland that works as a two way mirror. Showing us our inner world as though it is outside us. The physical eyes and ears, through which we constantly send and receive information to and from one another. The pituitary gland which regulates our hormone levels and activates our third eye chakra when we need it. The other parts of the brain are part of the third Eye chakra as well. Through this center we learn to see our inner world and we learn how to differentiate it from the outer illusion around us. We begin to realize that we are multi dimensional beings and can simultaneously operate in many dimensions. If we want to see far away places or if we want to see ourselves from the outside, we need to create a seer, (a small Angel or a fairy self for example) that we can send anywhere we want to, to see for us. Through the “eyes” of our seer we can examine ourselves from the outside. Through this center we can open a multi dimensional connection to our inner energy centers. We learn how to unify all our physical centers together, as we prepare to merge with our non-physical energy centers. In this center, at the latest, our kundalini energy is activated and we learn how we can use it to open the crown chakra. Once the lessons of this center have been learned, we are ready to fully communicate with our inner True Selves. Next we will learn how to part our inner sea and connect to our inner, non-physical, energy centers. Inside the Old Testament there are many clues about how our light bodies are structured. If we read the description for the blue print of the temple of Solomon, we will notice that God designed it to be built in the shape of a man: two legs (Boaz and Yachin), two arms, five fingers in every hand, and the Dvir (the holy of holies) which is located in the area of the chest. God wanted to remind us that we are the temple, inside which His light shines. This site, www.templesecrets.info shows amazing graphics of the temple, and it shows how the temple of Solomon was created in the shape of the human body. I recommend that you go to this site and have a look for your selves, before you continue on reading. Since Solomon’s Temple was built in the shape of a human body, it means that each one of us contains inside him or her self a Divine, a Holy place, where we can commute with our inner God. The word Dvir (דביר) itself is from the root DVR (דבר), which means “to speak”. The word Dvir also contains the Hebrew letter Yod (י), which is often used as a short form of the word signifying God in Hebrew, Jehovah (יהוה). Together they mean ”to speak with God” (דבר י). 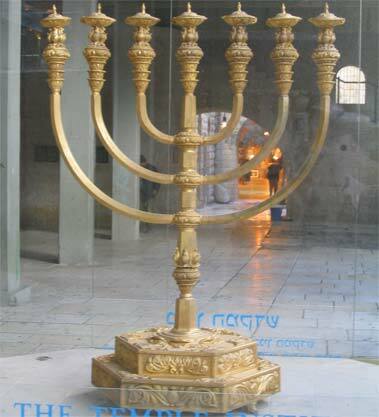 According to the Old Testament, Solomon’s Temple had a Menorah inside of it. The Menorah is supposed to be a candle holder for seven candles. If we’ll examine the structure of the Menorah closely, we will see that it is in fact a representation of our chakra system, which also shows the balancing principle behind it. It’s a bit hard to see it at first, but once we turn the Menorah 90 degrees to the left, everything becomes much clearer. As you probably already know, the unified consciousness that is Mother Earth is raising from the third to the fifth dimension. Right now we are somewhere in the fourth dimension. This process is both global and personal. Each one of us is experiencing the same process on individual level, and once enough of us have risen to the fifth dimension, the whole unified consciousness will raise too. Since we are all a very long way into the process, we can activate our fifth dimensional light bodies right now, if we want to. You can activate your fifth dimension light body with the following meditation, which is based on the Golden Lily meditation.